Got an old laptop? Donate it! Have you replaced your laptop in the past five years? Glasgow ARM can give old laptops a new life and a happy home! Glasgow ARM (Advancement for Rwandan Medics) is a joint student-staff charity formed to support the work of UofG’s Professor Phil Cotton, recently appointed Vice-Chancellor of the University of Rwanda. The laptop appeal is one of a number of initiatives. Thanks to generous donations by staff and students we have already sent out nearly 50 laptops. Students with disabilities and with no family support have especially benefited. Aline is disabled and relies on a wheelchair and her pal Leonie for help. 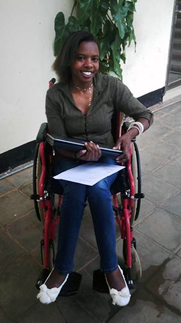 She can't access the computer lab or library because she can't manoeuvre her wheelchair over the rough terrain at Kibuye Campus. Aline is one of the students who were selected to receive a laptop from the ones you sent last time. This has had a profound effect on her access to learning materials and engagement with her course. Our University IT colleagues will securely wipe and re-format the hard drive. Please check that your laptop does NOT have hardware problems, a broken screen, poor power connections or any other disabling problem.